Shannon Ross, MD with a pediatric patient. 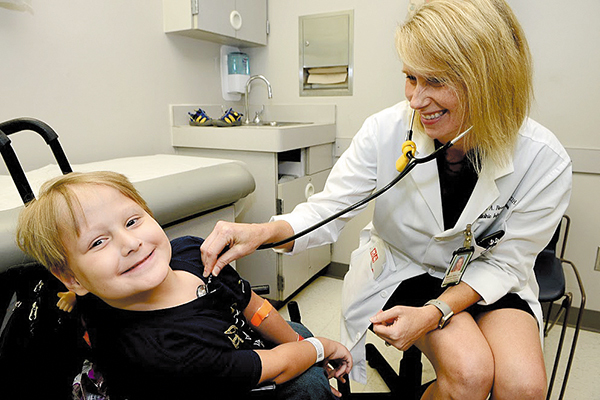 As an associate professor in the Division of Pediatric Infectious Diseases at UAB and practicing physician at Children's of Alabama, Shannon Ross, MD has seen her share of patients with antibiotic resistance. As the medical co-director of the Children's antimicrobial stewardship program, she leads a team that works to implement guidelines on appropriate antibiotic use and seeks to educate elected officials, patients, and other physicians about the overuse of antibiotics. "Around a half of all antibiotic use is probably unnecessary," she said. "It may be higher than that in the outpatient world. There are certain specialties that are worse than others. Pediatrics is one of the worst offenders. It's staggering." For two years now, Ross has attended the Supermoms Against Superbugs annual meeting in Washington D.C. During the event, which is sponsored by Pew Charitable Trusts, parents, physicians, researchers and others meet with legislators to make the lawmakers aware of the severity of the situation, so they will continue to support efforts to end the problem. "There is a big push with the agricultural industry," Ross said. "There is a lot of antibiotic overuse in agriculture, particularly with meat production. So farm representatives are also there." The participants also advocate for continued funding for the Centers for Disease Control. "This is important," Ross said, "because we physicians use a lot of CDC information to help us take care of patients, and to help us educate and advocate. "We also talk about drug development and new antibiotics at the meeting. A lot of people think we'll just develop more antibiotics, but that won't cure the problem. The resistance has outpaced the development of antibiotics." In addition to educating legislators, Ross recognizes the importance of educating physicians about their role in antimicrobial resistance. "We physicians don't always think that our day to day antibiotic prescriptions impact things from a global public health perspective. But all antimicrobial misuse will lead to the development of antibiotic resistance. It's not necessarily one individual. It's all the individuals collectively. What drives antibiotic resistance is overuse and inappropriate use." Ross cautioned that antibiotic resistance is only one bad effect of antibiotic overuse. "C. diff is the big one," she said. "That has become a huge problem. Lots of money is being spent on C. diff infections because we are using too many antibiotics. We spend a billion dollars in excess medical costs per year just for C. diff, which is directly related to antibiotic use." Ross reminds doctors of the "Five Ds" of antibiotic stewardship: diagnosis, drug, dose, duration and de-escalation. "Make sure you are giving the right drug for the right diagnosis for the right duration of time," she said. "If the patient needs the antibiotic, do you know if the bacteria is susceptible, and are you using the appropriate dose for the appropriate duration? And in the inpatient world, when can you narrow your therapy and change from Iv to oral therapy?" Ross also believes educating patients is important, although she acknowledges it can be difficult for many physicians to find the time. "Studies cite patient pressure for prescribing antibiotics," she said. She suggests that physicians explain when antibiotics won't work --when the infection is viral for instance - along with the potential side effects of antibiotics, and the problems that result from overuse. "Usually going through all that will work with a patient. If patients realize the risk, they aren't going to ask for them as often." Ross said doctors are going to hear more about antibiotic resistance in the future. "The Joint Commission now requires hospitals to have antimicrobial stewardship efforts," she said. "Part of the requirement is education of all providers, anyone who touches a patient getting antibiotics. That's pretty much everyone: nurses, pharmacists, everybody." In the meantime, Ross is doing all she can to educate legislators, physicians, and patients, as well as to provide them with the information they need to educate others, until antimicrobial resistance is a thing of the past.